With the management team finalised, attention has now turned to recruitment of players at Leeds United with a first major new face introduced and more expected to follow shortly. Polish midfielder Mateusz Klich was revealed on Friday, signed on a three-year deal from Dutch club FC Twente for a fee believed to be £1.5 million. He is straight into training with his new team-mates with the players reporting back for pre-season on Monday. The former Wolfsburg and Kaiserslautern footballer is ready to become the first Polish footballer to represent Leeds in competitive games and cannot wait to get started. He said: “I had a good season at Twente and I felt good there, but the decision wasn’t really difficult because it’s the dream of every small boy in Poland and Europe to play in England. “I wanted to come here – I remember Leeds playing in the Premier League. New head coach Thomas Christiansen is hoping Klich will add creativity to Leeds’ play. He said: “He’s an exciting addition to the squad, with the ability to create and score goals. “A player needs certain things to succeed in the Championship and we believe Mateusz has the quality and physical strength that will improve our squad. “He has the desire and hunger to succeed, which we are looking for in the players we bring to Leeds. One of those deals was completed yesterday with 20-year-old Spanish midfielder Madger Gomes signed following his release by Liverpool. He is seen as one for the future as he will initially link up with the under 23s, with a view to training with the first team. Elsewhere, Leeds have been linked with SD Huesca forward Samu Saiz, with a £3 million bid believed to have been tabled, and Macedonian winger Ezgjan Alioski, who scored 17 goals for Lugano in the Swiss League last season. If these moves do not come off, alternatives are being lined up and one could involve bringing Morley’s Jonny Howson back to Elland Road with Norwich City putting a price tag of £5 million on him. Leeds are also looking to strengthen their defence with Iceland international Sverrir Ingason on the radar. 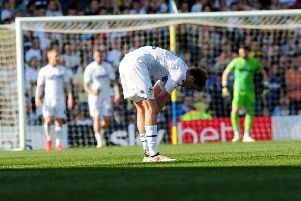 A player could be going out of the club with the long running Charlie Taylor saga likely to come to a head when he becomes a free agent on Saturday with his Leeds contract ended. Burnley are now at the head of the queue to sign the ambitious 23-year-old former Leeds player of the year with some reports this week saying he had agreed personal terms with the Premier League club. He had looked set to go to West Brom, but they were looking to do a cut price deal and a fee around £5 million is being talked about for the left-back.